When I decided to add 2015 to this journal I was suprised to find huge gaps in the photos I'd taken. The major gap is from February to July. That's a lot of missing photos of fishing and farming. I will try to be more attentive next year. Promise. Oh, we made a trip to Costa Rica in March. I prepared a video of all the birds we saw for the Audubon Christmas party. Since it was a lot of work and pretty much tells you everything you might want to know about our trip I've added a link here to take you to Vimeo so you can see it. Click here. January 20. Heard there were tilapia to be caught near the Gallatin Steam Plant. Found a put in not too far from the place and kayaked over. Caught nothing but bream. Should have been there yesterday. Yeah. February 17. We got a lot of snow and sleet for several days. 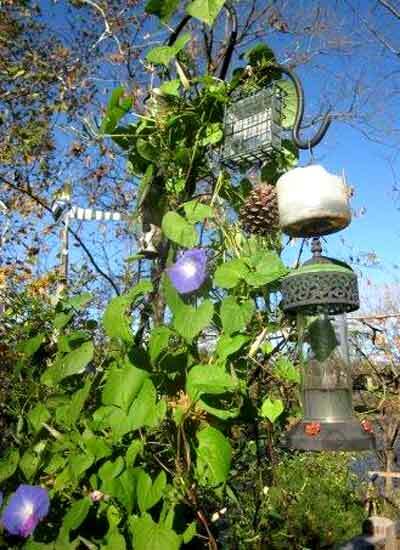 Made for a lot of birds at the feeder. The grandbabies liked it. Took them over to Two Rivers Park to sled and, even though some crazy sledders were there as well they had a good time and didn't get hurt.. 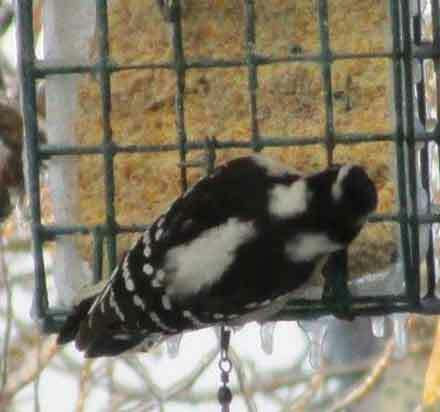 The little Downey Woodpeckers stayed on the peanut butter all day. First the male and then the female. They didn't share. This one is the female, without the red on the head. 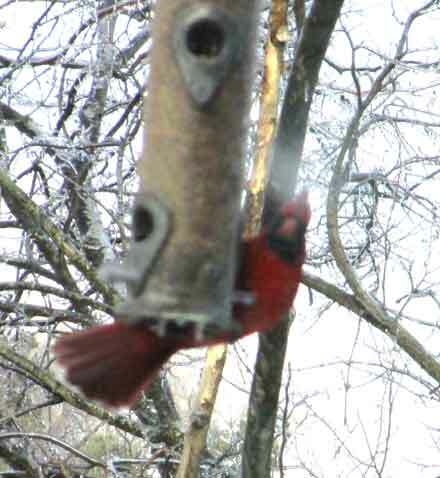 The Red Birds were big customers. Mostly on the seeds that fell to the deck. They tried to eat out of the feeder too, but that seemed like too much work for too little return. 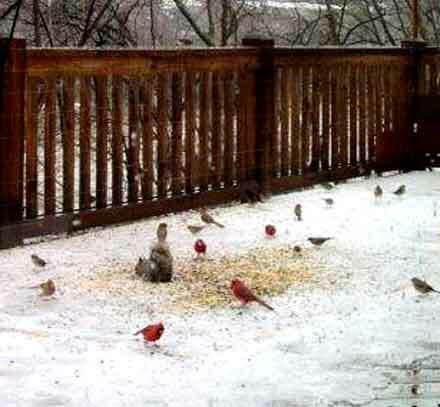 As you can see we had a good turnout on the deck including Mr. Squirrel. I had made a feeding area by tacking down row cover, a netting used to cover crops, so the seeds wouldn't fall through the cracks so much. Sometimes the doves pretty much took over, especially late in the day. 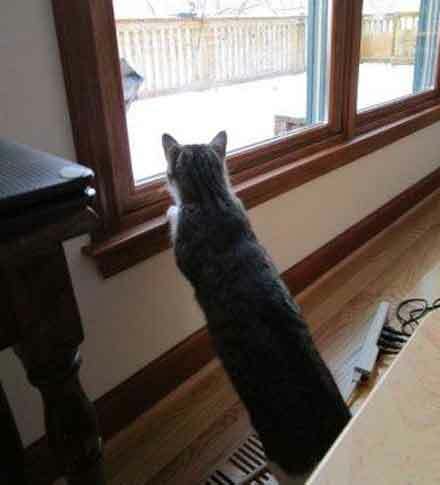 Miss Jane Tabby found the banquet, so near and yet so far, endlessly fascinating. 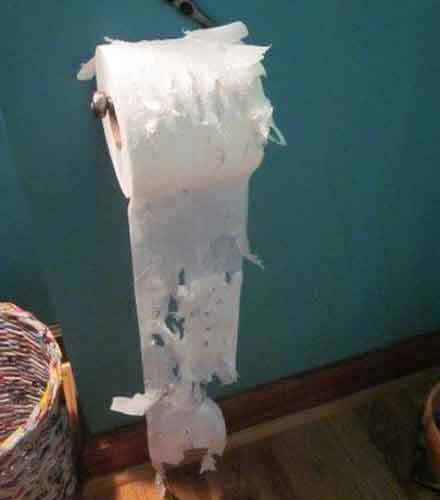 When frustrated Miss Jane likes to play with the paper she can find unguarded. 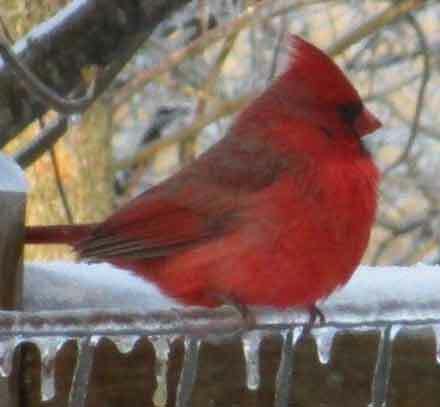 We love to see the bright red of the Cardinals puffed out against the cold. They are tough little birds to stay here in all this cold. So do the Robins and Blue Birds, who eat worms and bugs. 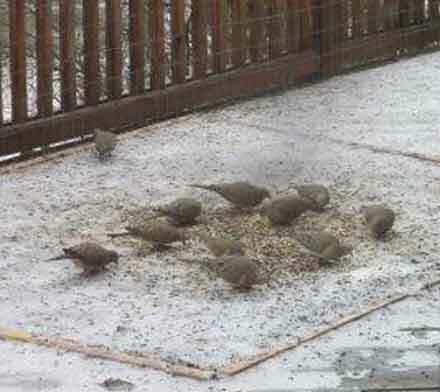 They don't come to the feeder, so where do they find enough food to survive? 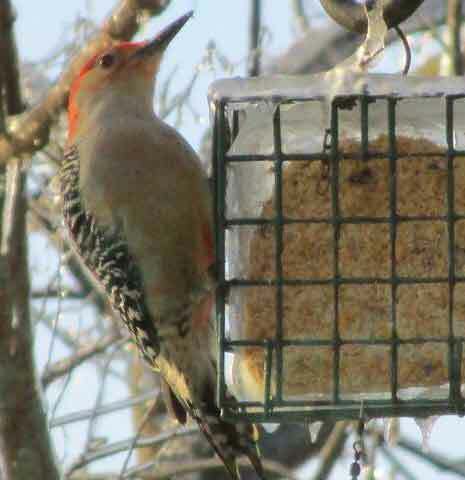 This is the Red Bellied Woodpecker. There is some faint red on it's belly but plenty on it's head. Oh well, I didn't name it. July 1. 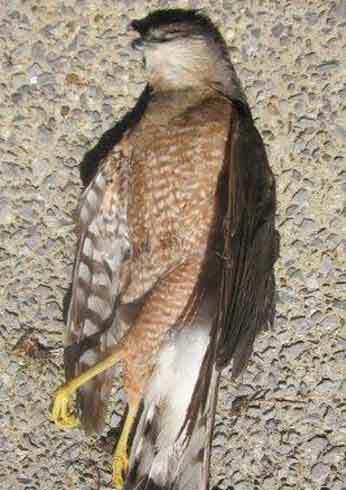 Sherry and I had seen this beautiful hawk for several weeks. Then he disappeared. I found him beside the road. Hit by a car most likely. Hawks swoop across the road and are so zeroed on their prey they don't notice anything else. July 3. 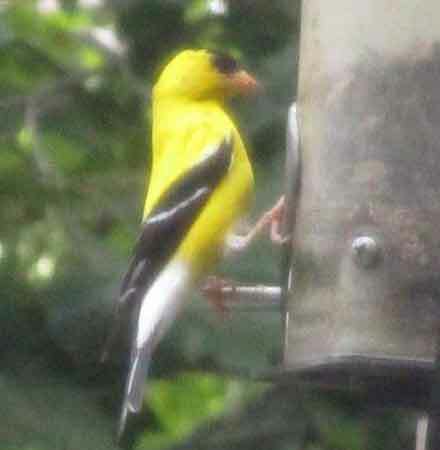 The Male Gold Finches are visiting the feeder along with Chickadees, Titmouses, House Finches, and Purple Finches. So much to see on our back deck. 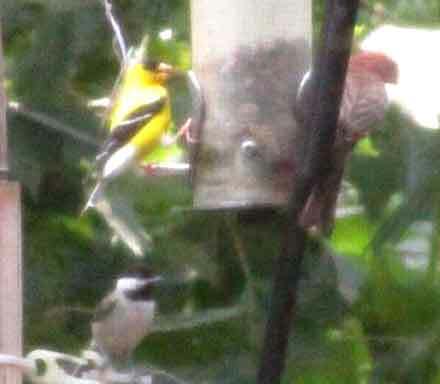 Here we have the Gold Finch, a Purple Finch, and a Chickaee. The Chickadees knock 3 or 4 times more seeds out than they eat. But there is always another bird down on the deck picking up the dropped ones. July 4th. 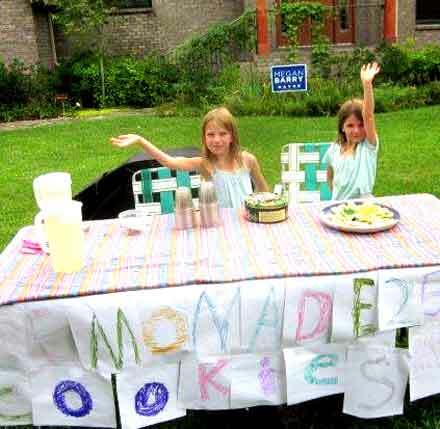 The girls set up a lemonade and cookie stand in the front yard. It was hard to flag down cars, but they had some success. A few of our neighbors came down and a pizza delivery boy who stopped and asked for directions stayed long enough to become a customer. I think the girls learned a little about how hard it is to make a dollar, or even a quarter--where the goods were priced. August 10. 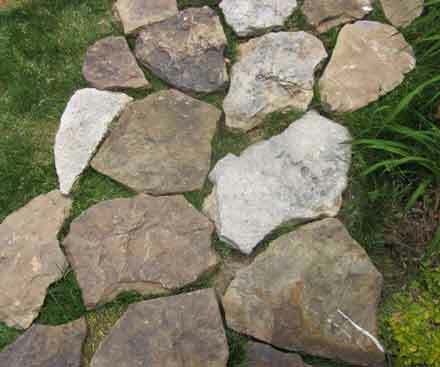 I laid out the flat rocks for the front walk. Later Sherry had a crew of hispanics set them in concrete. I liked the loose rocks better. Puppy loves to dig. He dug this hole over a foot deep trying to dig up what? 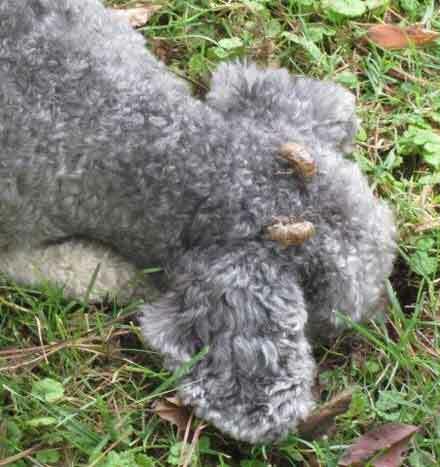 The girls decorated him with old locust shells and he never noticed. September. This is pretty funny. James lost my boat key ring with the float on it so I dug out this item that someone gave me at Christmas. It seemed too heavy to float to me, so I dropped it in a glass of water. Oops! 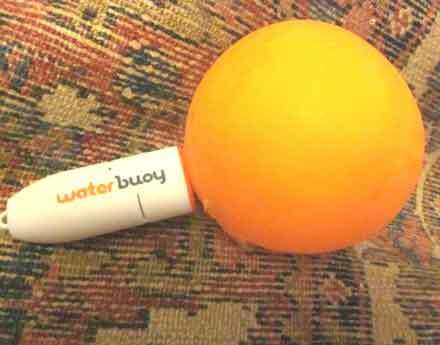 The balloon inflates when it hits water. Good one time only. Live and learn. September 12. All those Heavenly Blues I planted finally started to bloom. Once started, however, they kept going into early December when we finally had a frost. 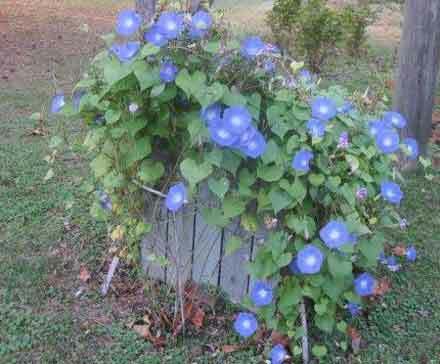 I planted these by the mailbox with a very tall and strong cane attached to the mailbox and buried in the ground. 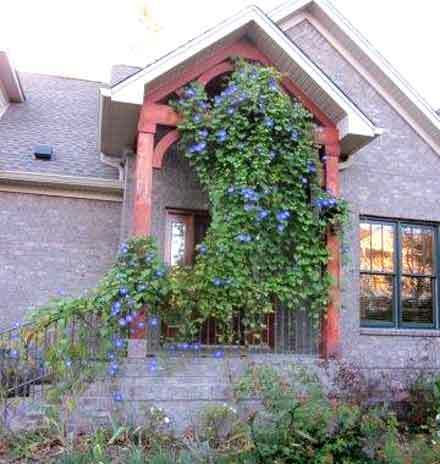 As you can see, the vines made it to the top but got too heavy. 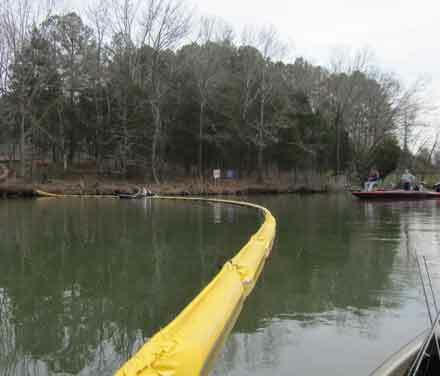 It finally broke, but was the wonder of Pennington Bend for a few weeks. Aren't they pretty? If the vines would have stopped growing my cane would still be whole. Well, here is a major project that worked out well, except that it almost killed me. 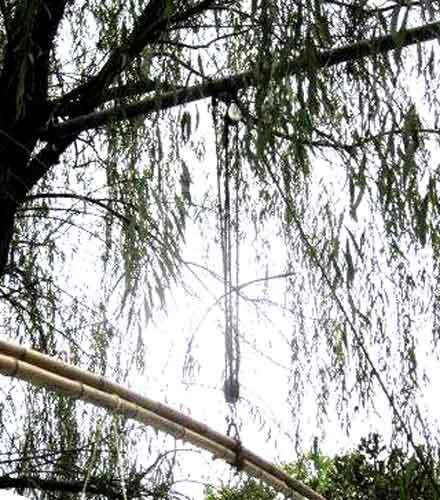 There is a steel pipe at the top and the top pully is attached up there. Getting the pipe up there wasn't easy. 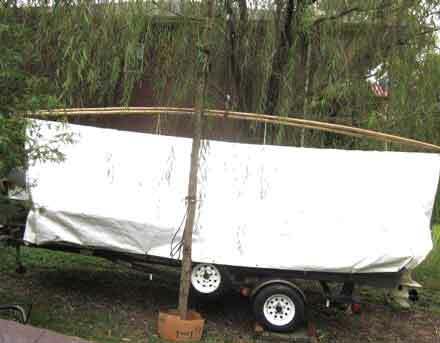 As I was tying it into the willow tree on the far side my ladder twisted and the next minute I was on the ground trying to figure out if I was seriously hurt. God takes care of idiots, I guess. 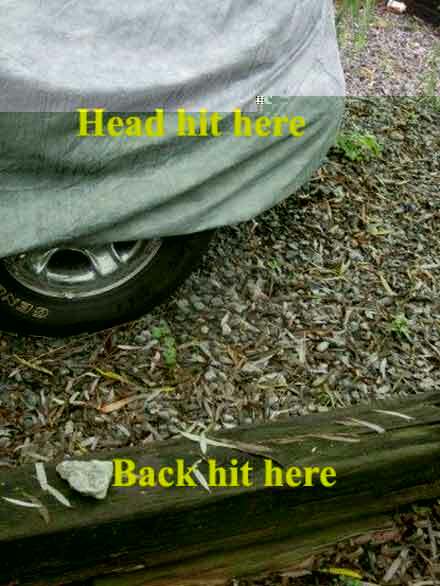 My back hit that cross tie and my head hit my neighbors fender. The fender had a cover and I had a hat on, but still my head was ringing and it took a while to get up. By a miracle my back was OK. I credit yoga with the save. 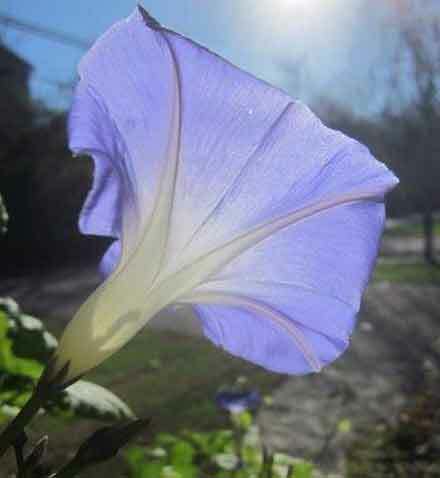 Here we are in the last part of November and the Blues are still as pretty and healthy as ever. Early December we finally got a frost and I had to pull them all down. The arch into our old yard was the most thick with blossoms. Beautiful. Sherry's garden on the deck was beautiful from May until the frost. 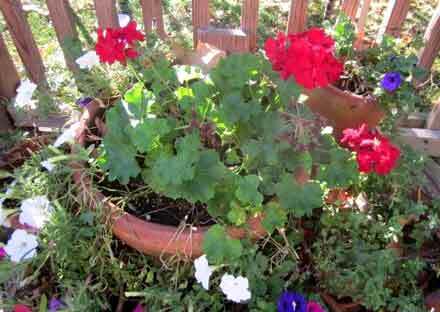 Sherry's Red Geraniums and Petunias of several colors really made the deck a treasure. Some of the Blues from the shady west side of the deck finally made it up the rails and onto the feeder and pinwheel poles. 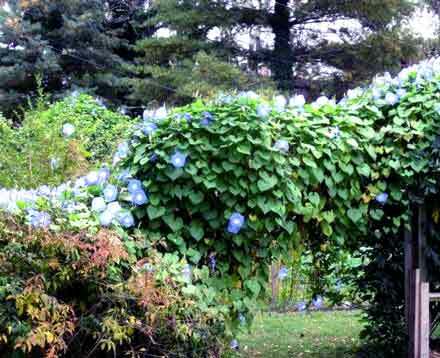 The birds liked the feeling of hiding in the leaves and vines.. 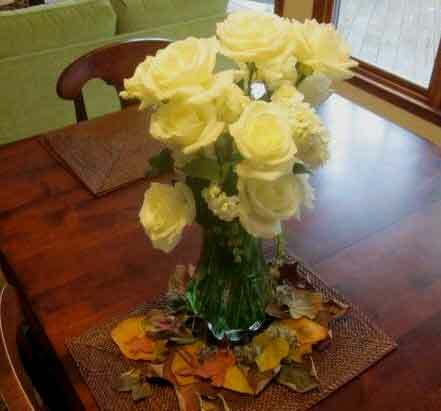 It's my good forture to have a sweetie who loves her flowers and enjoys arranging them. 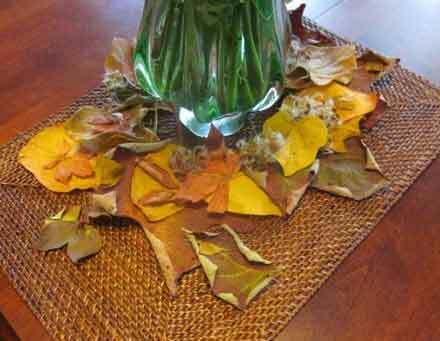 Here's an arrangement she made around Halloween. 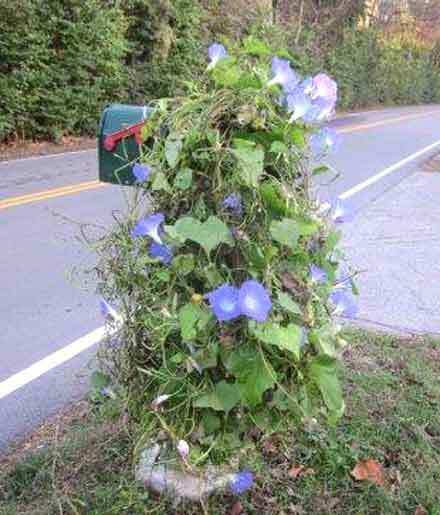 After the giant pole broke I arranged some of the vines around the mail box. The ones on my daughters mail box always are great, even though the soil there is the hardest and poorest you can imagine. Those around the gas meter were going nuts about this time as well. 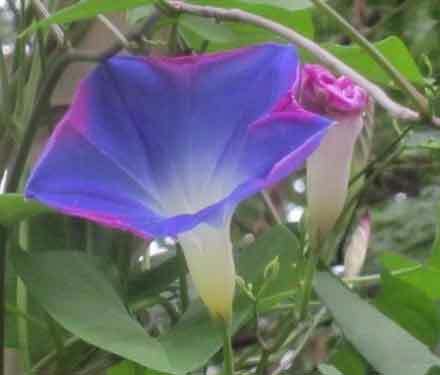 They are gone for the year now, but their beauty won't soon be forgotten. 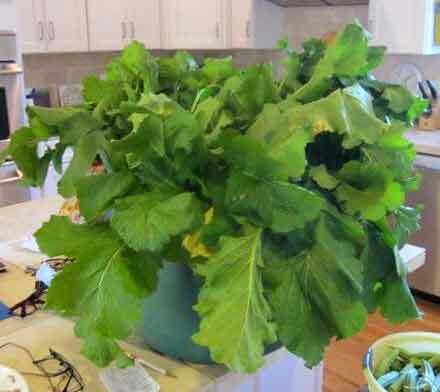 This is the only photo of garden produce, some of our turnip greens, and there are none of the garden itself. It was great this year. I have to do better recording it next year. I made saurkraut from some the turnips and it was great. Tasted more like cabbage than turnips. 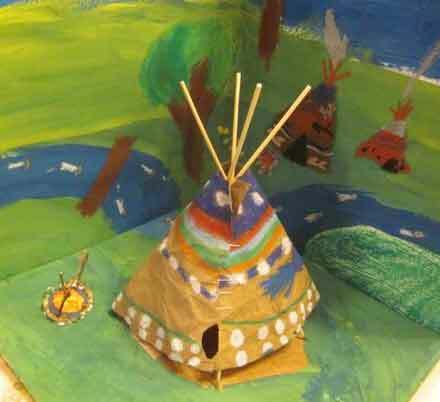 I thought this little diorama my grandbaby made for a third grade project was great. Both of the girls are very creative. Miss Kitty loves to curl up in different places as opportunity presents. 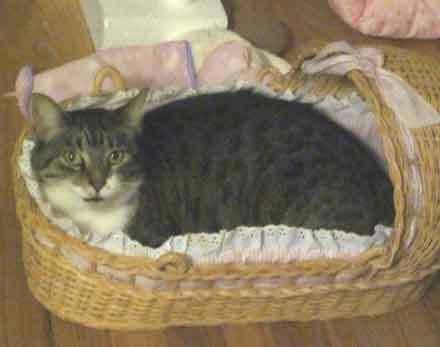 Here she finds a doll baby cradle to her liking. 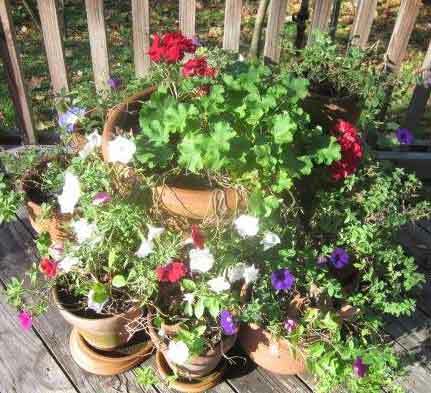 The deck flowers lasted until the frost in mid December. It only lasted one night and then we had record warm weather until the 29th of December. 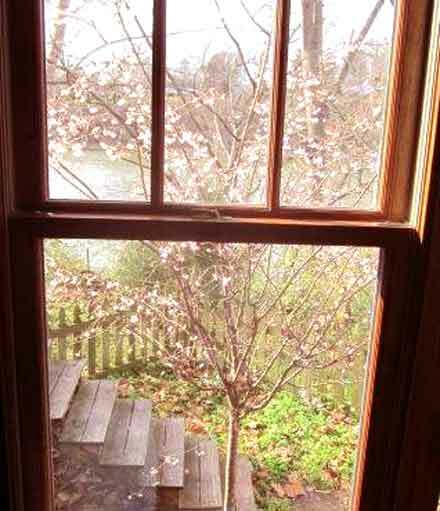 This is the Cherry tree outside our bedroom window. 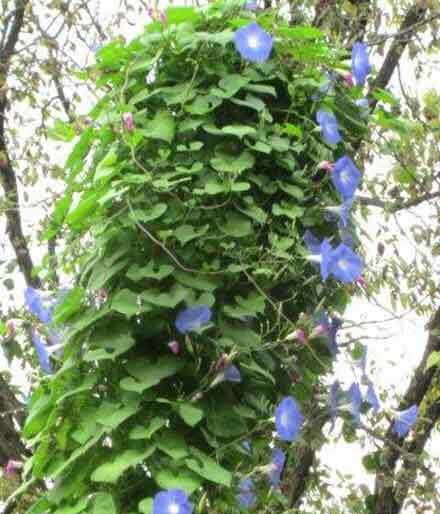 Today is January 1 and its blooms are still alive and healthy. 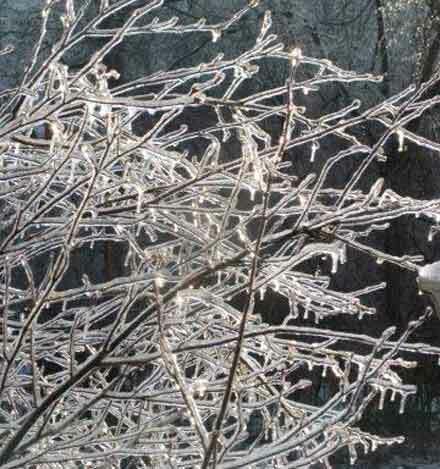 Last night was below freezing and colder nights are predicted now. So I guess the pretty pink blossoms are doomed and we will soon have to buckle down for some real winter weather. It was nice while it lasted.